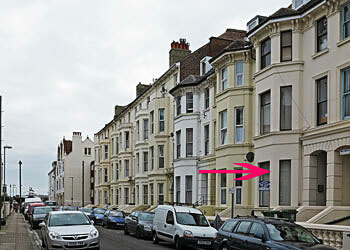 We own and rent a range of flats to rent in Southsea, Portsmouth. These range from small one bedroomed, large one bedroomed though to various two bedroomed flats. All our flats are clean and decorated in neutral colours. Typical agents fees will be £300 or more per person. Note that most agents charge fees of hundreds of pounds again at the end of the initial contract (usually 6 months) for a new Tenancy agreement. We do not have any further charges. If the tenant requires another fixed term contract we provide this free. Otherwise the tenancy become a Periodic. Once the fixed-term of a tenancy has expired unless a new fixed-term is agreed to, all tenancies automatically become periodic tenancies. Agents make tenants re-sign for a fixed term to increase profits from fee collection and also make it difficult for tentants to leave after say 19 months. Whilst our fees and rents are lower than those of the typical agent we do have similar requirements for prospective tenants. Tenants should be in full time employment. Information is required to complete a credit check. Minimum of 6 months tenancy. The reason we can not let to those on benefits or students is due to our financial and insurance requirements. Should you decide to rent............................... A holding fee of £300 will be required to hold the property until the moving in date. This is not an extra fee. It will be deducted from the amount due on moving in. It serves to show your commitment to renting the property. Note that if you decide not to proceed or if you fail to provide full and accurate information or you fail references your holding fee will be retained and the property will be re-marketed. We can show you properties at times convenient to you. Ring us with a problem and we take immediate action when required. Large unfurnished two bedroom lower ground floor flat in Nightingale Road, Southsea, PO5 3JL. Use of private garden. Fully redecorated with new carpets. One minute to Southsea Common. Suitable for a couple, two sharing or a couple with a child. £750 p month. Deposit £850.